The Republic trooper and the smuggler professions begin their lives in the same area under different circumstances. As a trooper, we started our career as the newest member of the elite Republic commando unit known as Havoc squad–a handsome human soldier riding on the inside of a giant walker into a war zone on the planet of Ord Mantell. The planet is a Republic world torn apart by a civil war waged by separatist rebels. As a smuggler, we played as a Twi’lek, which is the humanoid Star Wars race that has long tentacles down either side of their heads, similar to the Bib Fortuna character in Return of the Jedi. Yes, the Twi’lek are playable, and this one was a Han Solo-like ship captain who lands her Millennium Falcon-esque ship on Ord Mantell to drop off a weapon shipment to the Republic fort. Unfortunately for both characters, the Republic’s on-the-ground contacts double-cross the standing armies, siding with the separatists instead. 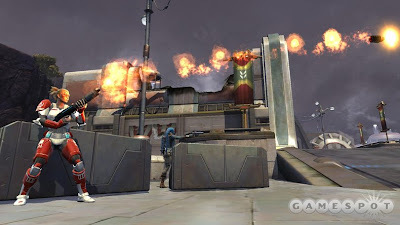 As a result, the separatists steal the smuggler’s ship and hack into the local artillery banks, which means that the beginner smuggler must go out on foot (or risk being shot down), while the trooper’s walker gets blasted by the commandeered guns and needs to go it alone on foot as well.